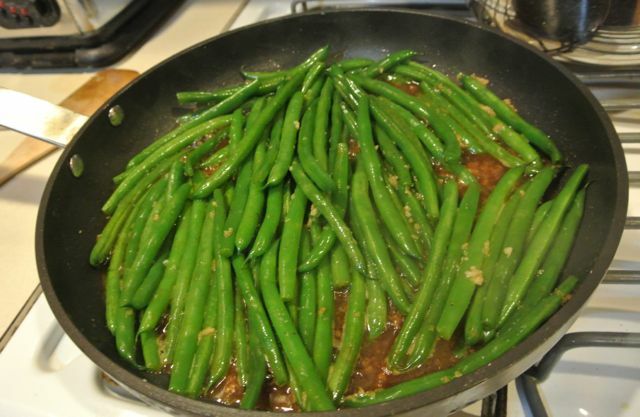 I really like the green beans sautéed with garlic that are on the buffet at Chinese restaurants. Sprout had a super sale on fresh green beans, so I decided to try my hand at making them on my own. Turned out great! They were so good! Trim ends off of green beans. Rinse. Bring a large pot of heavily salted water to a boil. Add beans and blanch for 3 minutes. Drain well. In a large sauté pan, heat oil over medium heat. Add garlic and sauté until fragrant, about 1 minute. Do not allow it to brown. Add green beans and remaining ingredients. Black pepper is to taste. Saute to desired level of tenderness.